Cedar Finance are no longer trading. For a list of alternative brokers, and full comparison reviews, visit our brokers page. Cedar are no longer trading. Regarded as one of the most professional options providers in the industry, Cedar Finance delivers on all fronts. With a strong sense of customer service and quality trading products, they have done much more than exceed trader expectations; they have developed the ideal trading experience. Traders will find that Cedar Finance offers highly competitive bonus offers for deposits and to start trading. Currently traders can receive Cedar Finance’s premiere bonus of $5000 as a Welcome Bonus. Beginning with such a high amount will enable new traders to open several options for a great start in building their newly formed portfolios. In addition, multiple bonuses are offered that range from 30% to 75% beginning with the Bronze Account offering a 30% Bonus up to $999 ($200-$999), Silver a 50% Bonus up to $4,999 ($1,000-$4,999) and Gold, which offers a 75% Bonus up to $9,999 ($5,000-$9,999). Cedar Finance is open to all traders with varying degrees of experience. Anyone can open a Cedar Finance account with the minimum deposit amount of $200. When opening an account traders will choose their preferred currency with a choice of USD, EUR or British Pound (GBP). The minimum trade amount at Cedar Finance is $5 for a 60 second option, $25 for a binary option and $50 for a one touch option. Opening an account is easy and can be done quickly directly on the Cedar Finance website. Currently Cedar Finance is available only in English but with more languages on the way. 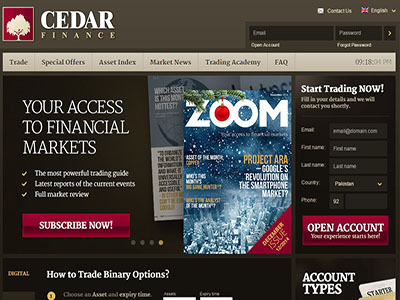 Traders will find that the Cedar Finance platform is simple and intuitive. The innovative platform enables traders to quickly navigate the website, choose assets and execute trades. Every function is made easy with Cedar Finance’s user-friendly platform. From funding an account or placing a trade, traders can do so quickly and securely. Cedar Finance has made it a goal to provide traders with the most comfortable trading environment possible and uses their advanced technology to ensure traders receive the best service. No matter your preference, Cedar Finance offers a diverse selection of assets that will surely add value to any trading portfolio. Here are some premium assets to look out for when opening trades, starting with Currencies: Euro/US Dollar, Great British Pound/US Dollar, Euro/Japanese Yen and many more. Some important commodities include: Gold, Oil, Sugar, Silver, Platinum and others. Cedar Finance also offers many premium indices such as: IBEXT, NASDAQ, S&P Future, NIFTY, TELAVIV25, KUWAIT, FTSE, DOW and more. No platform would be complete without a choice of amazing stocks to choose from. At Cedar Finance traders can trade BARCLAYS, IBM, GOLDMAN SACHS, COCA COLA, SBERBANK, REUTERS and plenty more. Fitting for a platform with a diversity of traders, Cedar Finance offers multiple investment options. Traders can choose from 60 second options, one touch options as well as a custom option builder. With 60 second options, traders can receive a quicker turnover of trades simultaneously for an exciting fast paced payout. On the other hand, the option builder lets traders choose the details of their trades including the asset as well as the expiry time down to the minute. Cedar Finance traders are supported with a team of brokers and market professionals. Tech support ensures an efficient, secure and quick trading experience while customer support offers all available market information by way of reviews, news and updates. Every resource is made available to Cedar Finance traders and at any time of day 24/7 traders can reach support through multiple methods of contact including email, live chat and telephone. From real-time stock quotes to assistance in funding an account, customer support is ready to help. Is Cedar Finance a Scam? Cedar Finance is a reputed binary options broker that provides excellent opportunities to increase your income. Cedar Finance offers returns as high as 80% on your investments, which is the highest in the industry. Binary options are high-risk investments and as such can lead to high yields as well as heavy losses. It is always best to gain comprehensive understanding of how the system of binary options trading works before you choose an asset for investment. Cedar Finance offers an excellent platform with secure payment gateways and good exposure to a wide spread of assets to choose from and trade with. Cedar Finance offers reliability, professionalism and integrity. Regarded as a leader in customer service due to their emphasis on education, market resource and round the clock support, Cedar Finance comes highly recommended. With equal levels of technological know-how and quality service and excellent payouts, traders receive a premium trading experience. Whether you are a beginner or an experienced trader, Cedar Finance caters to your needs and offers the best possible service. Click Here To Receive A $5,000 Bonus At Cedar Finance!